This interview with Balwant Rahangadale was conducted by Riddhi Pandey at Samnapur, Dindori District, Madhya Pradesh on November 19, 2017. The interview was in Hindi. Balwant Rahangadale is the District Coordinator for the National Institute of Women, Child and Youth Development (NIWCYD), Dindori District, Madhya Pradesh. He has been working with the Baiga communities of the Baigachak region for the past 18 years. Riddhi Pandey: Could you talk about the importance of ecological conservation in the bio-cultural lives of Baiga adivasis? 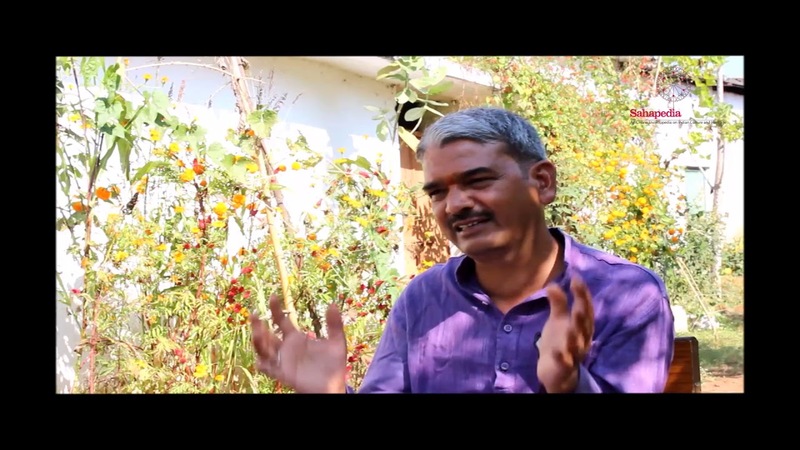 Balwant Rahangadale: If we look at the relationship between the Baigas and ecology, we can see that they complement each other. The Baigas exist because of the ecology and the ecology remains protected because of the Baigas. If the ecology is not pure and clean, then the very lives of the Baigas are threatened. Similarly if we look at the forests, or river streams or the land of this region, we find that their existence is connected with the habitation of the Baigas. These are protected because of the Baiga people. I want to emphasize this with two or three examples. The first is that the Baigas possess the most knowledge about the forests, compared to other communities. Their relationship with the forest is very intimate. They know when they must visit the forests, how much forest produce they can extract, all that they can get from the forests, which vegetation is used for what purpose, what is the role of birds and other wildlife in our lives. They are also aware of how each kind of flora and fauna must be protected. Whenever the Baigas want to bring any medicinal herbs or roots from the forests, they identify them and then immediately think of preserving them for the future. Whenever the Baigas take herbs or roots, they seek permission from Van Devi (goddess of the forest). She is worshipped first, and then her permission is sought, only after which the herbs and roots can be extracted from the forest. After the extraction, efforts are made for the regeneration of the plants. This is very special about the Baigas. Other communities may extract everything visible to them in the forests. But the Baiga people extract only as much as they need from the forests. Secondly, the Baigas are sensitive to how each tree should be chopped and its produce extracted in such a manner that the species is conserved. Moreover, the needs of the Baiga people are very few. We generally like to store more than necessary as we worry about tomorrow. But the Baiga people are not like this. They conserve resources. They think of one day at a time. And they know that the forests are an inseparable aspect of their lives, and if the forests are not there, then their lives would be in jeopardy. Whatever a Baiga needs, from the datoon to clean teeth in the morning, the bed on which he lies at night to the roof of his house, is provided by the forests. Hence, the relationship between the Baiga people and forests is absolutely inseparable; it is akin to the relationship of a mother and her child. Hence, the Baiga people regard the forests and the earth as mother. Different trees are also worshipped on different occasions. Another example that I would like to share is related to the several festivals celebrated by the Baigas. Some of them are related to conserving the forests and the environment. One such festival celebrated only among the Baiga community in Central India, is called the Ras Nava Festival. Ras Nava Festival is celebrated once every nine years when a particular plant called mohti blossoms. This festival, associated with protecting and conserving the honey bees, usually comes in the month of October. Only on the day or after it is celebrated, can honey be extracted from honeycombs in the forest in that season. The entire community gathers to celebrate this festival. Dongar kutki (millet), and honey are collected and mixed, and this mixture is filled in the holes in bamboo (poles) and cooked in fire. This is then shared and consumed by everyone in the village. In this way, their festivals are directly connected with the environment. Another example is the Bidri Festival when different types of seeds are collected and conserved. Then the Nava Khavai. Nava Khaana means only after the seeds and grains of each crop are matured, should they be consumed. For example, take cucumber. We consume cucumber when it is very soft and young with no seeds, when it cannot reproduce, that is when we try to consume it. But among the Baigas, it is the absolute opposite. They first check whether the crops have matured enough to be able to reproduce and then the festival of Nava Khavai is celebrated. This is celebrated uniformly among all Baiga tribes. There are several festivals of this kind among them. Another festival which I want to talk about is the festival of Dashara naach. It is also intimately associated with nature. The festival is celebrated at night, with the worship of nature, meals eaten in the forest, worship of the river and taking responsibility for the care of nature. This is followed by singing and dancing by young men and women, continuing into the night. There is a lot of purity in this festival: the songs create the setting for courtship. As they sing and dance, if compatibility is found, an understanding emerges, and they decide to spend their lives together, they go on to get married. This festival is also closely associated with nature. It is said that the Baiga was created by the earth. The first human is believed to be a Baiga. There is description of Naga Baiga and Naga Baigin (first Baiga man and Baiga woman).The first and foremost duty of the Baiga is to protect the earth. If the earth is protected, then the forests will be protected. If the forests are protected then water sources will also remain protected. If all of this are conserved, then we will have pure air to breathe and a clean environment to live in. Hence, the Baiga people are also known as Bhumia, those who have a right on Bhumi or earth. Thus the word Baiga does not mean a caste or a tribe; it is derived from the word vaidh, someone who is knowledgeable about forests and who can cure many illnesses. They were given the task of a pujari (priest) to take care of the well-being of every village. The titles (of different tribes among Baigas) have a very specific significance. They have titles like Samardahiya, Rathuria, Pachgaiya, Nandiya, Padiya, Chapudiya etc. These titles symbolize the places of origin of these families—particular forests, rivers and hills—which are known as the garh. These sites are particularly venerated and worshipped. Once a year, ritual prayers are offered. I want to give the example of Samardahiya. Samardahiya means those people who protect the wild Sambhar species. They will not kill or consume them. This is the identity of the Samardahiya people among the Baigas and protecting the Sambhar is their foremost duty. Similarly, if we consider the title Nandia, which signifies their association with the river, they are bound to the conservation of the river. Similarly, if we consider the title Padiya, where Padiya means the young offspring of the Van Bhainsa (wild buffalo), protecting which is their foremost duty. Thus different titles among the Baiga people signify their commitment towards conserving different trees, different birds, or certain culturally significant sites etc. The title of Chandraniya is associated with a garh and these people consider the bird known as Chandrama as one to be protected and worshipped as god. Similarly, for Rathuria people, there is a story associated with snakes which they protect. This is how all Baigas are associated with nature and natural elements. Baigas are particularly known to protect nature and the ecology. There is a variety of wild onion, the flower of which is used by the Baigas to predict the weather. The plant flowers in the month of May and has around 12 petals. They use them to figure out in which month how much rain can be expected. And then they plan their agricultural cycle on this basis. The Baigas believe that tilling the land is like tearing the breast of their mother. Now over time a lot of things have changed, but traditionally the Baiga people did not consider it appropriate to till the land and hence they largely practiced jhum or shifting agriculture. In this, they used to cultivate at least 24 different types of crop, which included grains, pulses, oilseeds, vegetables and spices. This way 24 to 25 types of food crops were cultivated together after levelling the land and setting fire to the existing vegetation, and seeds were sown in the month of May. They never tilled the land. From this we can understand that the Baigas were deeply concerned about nature and how it can be conserved. Their deep care for nature is evident in their festivals, culture and everyday way of life, building houses etc. Every material used to build the Baiga houses can be regenerated. Modern houses cause damage even to the land on which they get constructed. But one can be sure that the land on which Baiga people construct houses is going to get more fertile. One can expect the forests which the Baiga people have chopped or trimmed to grow denser. From the mushrooms which perish in a day to evergreen trees as tall as 80 feet—all are important for the lives of Baigas. I have spoken to several people over the last 18 years. I learned that the Baiga people extract over 43 varieties of uncultivated leafy vegetables from the forests, and consume over 18 varieties of uncultivated roots across different seasons. Seasons play an important role in their consumption. Consider the saroti bhaji which is collected in the month of May when summers are at their peak, it is useful for keeping the body cool and keeps persons healthy. This way, the leafy vegetables and roots are not only food but also have health and medicine-related properties. Along with nutrition they also help prevent possible ailments and illnesses. They consume 18 types of roots, and approximately 43 types of uncultivated fruits and flowers. Similarly, if we consider the medicinal herbs and roots, which we had identified with the Baiga communities in collaboration with the Jungle Adhyayan Mandal Programin which several local youth were trained, discussions with them revealed over 86 varieties of medicinal herbs and roots which can be used to cure five to six diseases otherwise believed impossible to cure. And several attempts have been made to conserve them. In this way we can see their association with the forest and today if we ask any Baiga where do they feel the happiest, then their first response will be that they will be happiest in the forests. Even if we take the Baiga people to the city and provide them with a lot of amenities, within two days they will want to go back to their forests. They do not like to live in cities at all. Even without electricity or roads, they lead contented lives in their villages. What we dismiss as wild vegetation, they happily consume. Their morning begins with going to the forest to collect food. This year between July and September in 2017, a lot of mushrooms were seen. Sixteen varieties of mushroom which grow in different seasons are consumed, starting from the second week of June until the first week of October. This year the harvest was plenty but they would only harvest as much as they needed. If a family needed only 2 kg, they would only take that much. Hence, this allows the forest resources to be conserved and shared with other families and with birds and wildlife as well. In this way we can see that they have a very intimate relationship with nature. In my understanding, calling a Baiga the ‘child of nature’ is absolutely true. And I feel that the Baigas can conserve the ecology the best. Today we are globally experiencing the crises of global warming and climate change. But in this region where we see the inhabitation of Baiga people, they can adapt to less rainfall by cultivating certain crops which can feed them the entire year. Similarly they can collect food from the forests and even from rivers. Thus, the Baigas are not insecure per se, but if we impose our schemes and lifestyle on them, then sometimes they become insecure. Over the last 18 years in my work, I have not seen a single Baiga person commit suicide. Malnutrition among Baiga people is also very rare. Definitely, ever since the forests have become monocultures, malnutrition has increased among the Baiga people too. But wherever the natural forests exist, they have vegetation with the lifespan ranging from one day to a thousand years. For example, the Mahul Bela (creeper) can survive for around thousand years, and its leaves, trunk, flowers, fruits all are consumed as eatables as well as used for other everyday needs. Thus, if we see, the Baigas are completely dependent on them. And in today’s situation, we can say that the Baigas will be happiest if their forests are conserved. In the Baigachak region, there is a river, which has been given a status similar to the Narmada. All Baiga people worship this river, just like Narmada has been given the status of the mother and is colloquially known as Maiyya (mother). The elder sister of the Narmada river is known as Boodhi Ma (old mother) here. This boodhi ma or Budhner river is the most important river in the Baigachak region. But people don’t call it Budhner, instead call it the Boodhi Ma. And this river is venerated the most by the Baiga people. The rivers in the region are worshipped on different occasions. When someone falls ill, then the rivers are worshipped. Water from this river is used in rituals during auspicious events like the birth of a child. If there are any weddings, then also water is taken from the river, and the first ritual worship is done at the site of the river. Thus, rivers have a very special cultural and ritual significance in the lives of the people and in their everyday lives as well. For example, if one wants to carry out a ritual worship, water is brought from the Boodhi Maiya river. And so on. Let us talk about the staple food of the Baigas. If we look at our own food we find the main components to be grains, vegetables, and pulses. But among Baigas, their food largely comprises uncultivated food. They prefer to gather from the forests. For example, when the Baiga people go for hunting, they do it collectively. These days several restrictions have been imposed on hunting, and hence it has become difficult for them to go for hunting in the forests. But they really cherish experiences and opportunities for hunting. Even if they hunt a small rabbit, they rejoice in eating it. And everything is shared within the collective. So now hunting has become extremely rare. But the other thing that is practised every week on Sundays is that all women together go to the river collectively. There they catch some fish and crabs and bring back together for food. Baigas will never buy fish from the market. If you take it to them, then also they won’t consume it. They prefer to consume only what they have caught themselves. And meat is relished by the Baiga people. We have tried several times to motivate the Baiga people to raise their own fish in a pond or to raise domestic animals and poultry for meat. But that they do not pursue it enthusiastically. They might not refuse proposals of this kind. But they get more joy in hunting and fishing. Even if they manage to get only small quantities of fish or meat, it doesn’t worry them. They feel great satisfaction in the practice of collective hunting and fishing. So, meat is greatly cherished by the Baigas. And roots too. We tried to encourage them to cultivate them in their homes and fields. The roots like the daangkaanda, rataalkaanda, jimikaanda, kochaikaanda, barmaraskaanda, baichandakaanda (different varieties of roots)—we tried to motivate them to grow those in their fields or land, but they did not show much interest in doing so. They rejoice in going to the forests to get them and if one person finds it, they shout out to all others looking for them. And then, they collectively dig it and bring it and even reprimand those who do not extract it effectively. And even if the quantities are small, there is a lot of joy in bringing it from the forests. The satisfaction that they experience in all of this is amazing. This is seen in the Baiga people. Secondly, the bhaajis or leafy vegetables have a very important role in this region. But if you try to cultivate them, then they will not be interested. Spinach, methi, chaulayi, laalbhaaji—these cultivable leafy vegetables are not relished that much. If there is nothing available, then they will consume them. But they prefer those leafy vegetables which are found in the wild, in the forests. If there is some leafy vegetable growing on some tree, then the Baigas will call all others, and proceed to collectively gather it and share with each other. These practices of supporting and helping each other is important for the Baigas. And leafy vegetables are very significant in their food habits. Though with the younger generations trends are changing, the elder generations particularly relish eating kodo and kutki (grains). And they like to freshly pound them themselves. For example, if they want to make rice, they will prepare it from paddy, just enough for two meals at a time, and not for four days or one month together. They do not enjoy that. They enjoy this more. Fresh food is good for our bodies too, it is more nutritious, and tastier and richer in minerals as well.